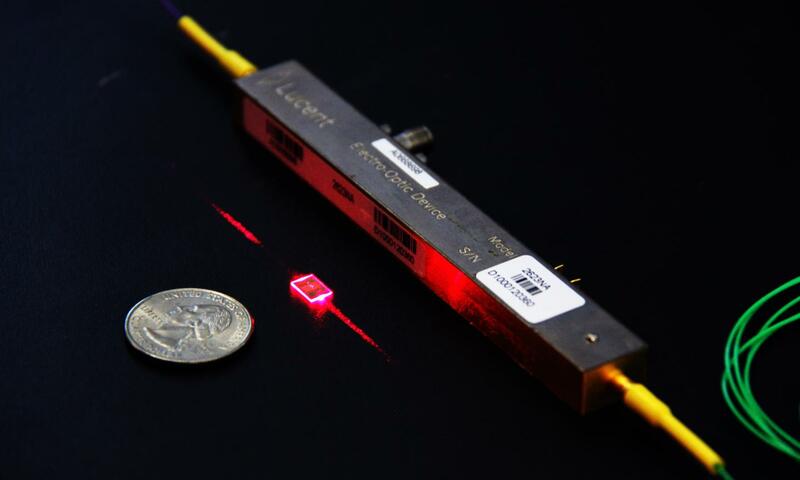 On-chip modulator; building a resilient solar grid; boosting fiber-optic networks. Researchers at Harvard SEAS and Nokia Bell Labs boosted shrunk down an important component of optoelectronics with an on-chip modulator that is 100 times smaller and 20 times more efficient than current lithium niobite (LN) modulators. Lithium niobate modulators form the basis of modern telecommunications, converting electronic data to optical information in fiber optic cables. However, conventional LN modulators are bulky, expensive and power hungry. These modulators require a drive voltage of 3 to 5 volts, significantly higher than that provided by typical CMOS circuitry, which provides about 1 volt. As a result, separate, power-consuming amplifiers are needed to drive the modulators, severely limiting chip-scale optoelectronic integration. Previously, lithium niobate was considered too difficult to work with on small scales, limiting its use in on-chip applications. However in previous research, the team demonstrated a technique to fabricate high-performance lithium niobate microstructures using standard plasma etching to physically sculpt microresonators in thin lithium niobate films. Combining that technique with specially designed electrical components, the researchers were able to design and fabricate an integrated, high-performance on-chip modulator. The team plans to commercialize the technology through the startup HyperLight. The U.S. Department of Energy will be providing up to $46 million in research funding for projects that aim to stabilize the power grid for solar energy. Projects funded by the Advanced Systems Integration for Solar Technologies (ASSIST): Situational Awareness and Resilient Solutions for Critical Infrastructure will develop and validate control strategies, real-time system monitoring, communications and other technologies to make solar power at the bulk power and distribution levels more resilient, including against cyber and physical threats. With over 58 gigawatts installed across the U.S, solar provides nearly 2% of the country’s annual electricity, according to the Energy Information Administration. In some states and regions, solar represents up to 15% of total annual electricity generation, and during peak times can account for nearly 50% of instantaneous demand. One major goal of the projects is increasing grid operators’ situational awareness photovoltaic systems so they can ensure continuity of service during widespread disruptions from either man-made or natural threats, as well as how a fleet of multiple solar systems in different locations could respond to fast-changing conditions under normal operations and could provide power to critical loads during grid outages. Another key focus is projects that go beyond R&D to include field testing. About ten projects, varying from $2 to $10 million in size, will be funded over 3 years. Scientists at the University of Sydney, Monash University, and the Australian National University developed a chip-based information recovery technique for fiber-optic networks that eliminates the need for a separate laser-based local oscillator and digital signal processing system to unpack the photonic information and translate it into electronic signals. The incoming photonic signal is processed in a filter on a chip made from chalcogenide glass. This material has acoustic properties that allows a photonic pulse to ‘capture’ the incoming information and transport it on the chip to be processed into electronic information, removing the need for complicated laser oscillators and complex digital signal processing. The photonic-acoustic interaction harnesses an effect called stimulated Brillouin scattering, which has been used by the Sydney team to develop photonic chips for information processing. The technique can boost processing speed by microseconds, reducing latency. “While this doesn’t sound a lot, it will make a huge difference in high-speed services, such as the financial sector and emerging e-health applications,” noted Amol Choudhary of the University of Sydney Nano Institute. “Our demonstration device using stimulated Brillouin scattering has produced a record-breaking narrowband of about 265 megahertz bandwidth for carrier signal extraction and regeneration. This narrow bandwidth increases the overall spectral efficiency and therefore overall capacity of the system,” said Choudhary. The technology could potentially be used in a range of local and access networks, including metropolitan 5G networks and IoT. Next, the team plans to construct prototype receiver chips for further testing.